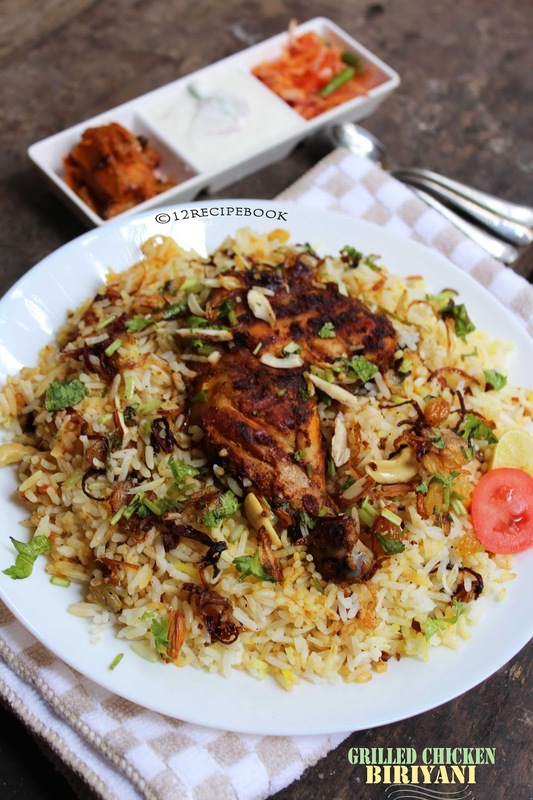 The grilled chicken pieces well coated with onion masala and cooked rice makes the flavorful Grilled Chicken Biriyani. It's perfect preparation for a fancy dinner party; try it once and you must start making often!! Mix the ingredients from 2-6 and make a thick paste. Cut the chicken in to 4 large pieces; Flatten them with a ladle or ax..
Wash well and pat dry with a kitchen towel. Make sharp slits on the chicken pieces and apply the thick marination evenly all over. Rest in fridge for at least 4 hours or overnight. After that do a pan grill or in the oven by applying little oil. Grill until cooked well and browned on top. Heat oil in a pan; saute onions until transparent. Add ginger garlic paste and green chilly. Add all the powders one by one and mix well after each addition. Add tomato pieces and sauté until mashed well. Boil water in a large pan by adding salt,cardamom, cloves, cinnamon, bay leaf and cumin seeds. When it boils add drained rice and cook it until ¾ th cooked. In a large dum pan add a tablespoon of ghee. Spread the prepared chicken masala on top. Above that spread cooked rice evenly. Spread the garnishing ingredients on top along with a chicken piece. Cover the lid tightly; so that no more steams to be escape. Cook on simmer mode for 20 minutes.